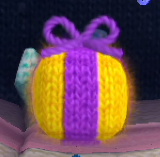 A Present Box is an object found in the game Yoshi's Woolly World. When Yoshi unravels one with his tongue, the box will reveal an item that he can pick up. Usually the items are either Wonder Wool, a Smiley Flower, Beads or Keys, but other things can be found inside them, like ! Switches or even enemies such as Fooly Flowers or Boos. Most often, Present Boxes appear as yellow boxes with a purple ribbon wrapped around them. Sometimes, they appear as an outline floating still or flying around in the sky with the use of a propeller. When Yoshi throws a Yarn Ball at it, the box will be filled into a normal Present Box and fall down. If there is water or a pit underneath it, the box will fall through and will not be able to be used. The present will be colored as the yarn ball that formed it, with either a yellow or purple string, determined by the color of yarn ball thrown at the Present Box frame. This page was last edited on February 23, 2018, at 10:08.